Are you applying for a Temporary Seller’s Permit? Are you changing from one type of business organization to another? Will you be selling cigarettes and tobacco products? Will you be selling tires (includes sale of new and used vehicles or farm equipment)? Will you be selling covered electronic devices (e.g., television, video or computer screens greater than 4 inches diagonally)? Will you be selling lumber products or engineered wood products? Will you be selling prepaid wireless services at retail? Are you buying or transferring an existing business? Do you have a Terminal Control Number (TCN)? Do you have the IRS Letter of Registration/637 Registration Number? Do you have a PUC number? Do you have a license for commercial cannabis activities? Have you harvested timber or forest products in California? Do you own and/or plan to harvest timber or forest products in California? Do you operate a qualified motor vehicle? Is the address located within city limits? Do you want to pay tax for an exemption claimed? Register a business activity with the CDTFA. Register for a Permit or License. Any person operating a qualified motor vehicle registered in California with interstate travel is required to be licensed under this Agreement, except as indicated in International Fuel Tax Agreement (IFTA) Articles of Agreement Sections R310 and R500. Interstate travel: Travel within California and any other IFTA member states or Canadian provinces. The Timber Yield Tax is a property tax with a current rate of 2.9 percent. This tax applies to the harvest of forest trees, whether standing or down, for wood products. As a timber owner, you generally owe the tax when your trees are harvested. See Publication 87, Guide to the California Timber Yield Tax, for additional information. California Fuel Trip (CFT) permits allow out-of state registered owners to enter and travel into California for 4 consecutive days without obtaining a license for fuel tax purposes. This permit also allows California registered carriers to re-enter California after traveling out of state if they are unlicensed for fuel tax purposes. The CFT permit must be obtained and completed prior to entering the state. In lieu of paying the use fuel tax on the basis of the number of gallons used, the owner or operator of a motor vehicle propelled by a system using liquefied petroleum gas (LPG), liquid natural gas (LNG), or compressed natural gas (CNG), who operates the motor vehicle exclusively within California, may elect to pay the fuel tax for the use of such fuels on an annual flat rate basis. If you purchase items from out-of-state retailers that are not required or authorized to collect California tax and then use, give away, store, or otherwise consume the item in this state, you may owe California use tax. This is true whether you order the item over the Internet, by telephone, or by mail. Generally, use tax will apply to the purchase of the same item from a retailer located outside this state. If the out-of-state retailer does not collect the California tax which is due on your purchase, you are required to report and pay use tax. You can file and pay the lumber products assessment as well as any applicable use tax along with your sales and use tax return online. You may also file and pay prepaid mobile telephony services (MTS) surcharge on wireless products/services. You can pay use tax on one-time purchase item(s) if you do not have a seller's permit and are not required to register for a use tax account as a qualified purchaser. You can pay the prepaid mobile telephony services (MTS) surcharge on wireless cards/service. You only owe the prepaid MTS surcharge when you purchase MTS products from a retailer in California who did not charge and collect the prepaid mobile telephony services (MTS) surcharge from you on your purchase. Note, effective January 1, 2017, retailers who sell less than $15,000 of prepaid MTS products are not required to collect surcharge from their customers. The retailer will still charge and collect the sales tax from you on your retail purchase if applicable; therefore you are only responsible for paying the prepaid MTS surcharge directly to the California Department of Tax and Fee Administration (CDTFA), not the tax. You owe the prepaid MTS surcharge and any applicable use tax when you purchase from an out-of-state retailer for use in California. See Prepaid Mobile Telephony Services Surcharge for more information. Beginning January 1, 2013, a 1% lumber products assessment is imposed on the use of lumber or engineered wood products in California. In general, lumber products and engineered wood products subject to the assessment are building products usually used in construction in which wood is at least 10% of total content. For example all dimensions and grades of lumber, roofing, (shakes and wooden shingles), siding, lath, plywood, particle board, fiberboard, oriented strand board, I-joists, laminated veneer lumber, veneer-based sheeting material, and inorganic-bonded and wood thermoplastic composites, including plastic lumber and decking (these are examples only; additional products not listed may be subject to the 1% assessment). If you purchase lumber or engineered wood products from out-of-state retailers, you may owe the 1% assessment as well as the use tax on your purchase. You owe only the 1% lumber assessment when you purchase lumber or engineered wood products from a retailer in California who did not charge and collect the 1% lumber assessment from you on your purchase. Note, effective January 1, 2015, retailers who sell less than $25,000 of lumber or engineered wood products are not required to collect the1% lumber products assessment from their customers. The retailer will still charge and collect the sales tax from you on your retail purchase of lumber products, therefore you are only responsible for paying the 1% lumber products assessment directly to the CDTFA, not the tax. You owe both the use tax and the 1% lumber assessment when you purchase lumber or engineered wood products from an out-of-state retailer for use in California. If you do not have a seller's permit and are not required to register for a use tax account as a qualified purchaser, you can pay the lumber products assessment as well as any applicable use tax, by following the directions for one-time purchase item(s). On your small lumber purchase receipts where the retailer did not collect the lumber products assessment from you, you can wait until your net combined lumber purchases are $50 or more before reporting and paying the assessment to the CDTFA. See Lumber Products Assessment for additional information. The Cigarette and Tobacco Product Internet Program collects the California state excise and use taxes from California consumers purchasing untaxed cigarettes and/or tobacco products from out-of-state Internet retailers, and/or by way of mail or telephone, for self-consumption in California. Examples of items or goods are: furniture, giftware, hot food products, toys, antiques, and clothing. This includes items sold at retail, wholesale, or by the manufacturer. Common carriers (transporters), other than railroads and steamship companies, must also register with the CDTFA in order to transport alcoholic beverages into this state. Beer vendors must also register to report shipments into California. A brewpub is a restaurant authorized to sell beer, wine, and distilled spirits for consumption in a legitimate eating place that includes a limited amount of brewing of beer. Beer vendors are required to register with Alcoholic Beverage Control (ABC) to obtain a Certificate of Compliance. ABC notifies the CDTFA to register the beer vendor. The beer vendor must report beer shipped to California licensed distributors. Any common carrier transporting alcohol for delivery into California is required to have a common carrier license. An excise tax is levied on distilled spirits sales made in California by common carriers on board boats, trains, and airplanes, or by persons licensed to sell distilled spirits on board such boats, trains, and airplanes, at the same rates as set forth in the California Alcoholic Beverage Tax Law – Section 32201. See California Alcoholic Beverage Tax Law – Section 32202 for additional information. Products wrapped wholly in tobacco, or in the greater part made of tobacco, are not cigarettes when they weigh more than three pounds per thousand sticks; these products are considered tobacco products (for example, cigars). Any component, part, or accessory of an electronic cigarette that is used during the operation of the device when sold in combination with nicotine. Products that the U.S. Food and Drug Administration has approved as cessation products or for other therapeutic purposes (for example, nicotine patches). Any product containing, made, or derived from nicotine that is intended for human consumption. Examples include, but are not limited to, electronic cigarettes, atomizers, vaping tanks, mods, e-liquid or e-juice. "Retailer" means a person who sells cigarettes or tobacco products directly to the public from a California retail location, including vending machines. Retailers cannot purchase, or be in possession of, unstamped (untaxed) cigarettes and/or untaxed tobacco products. Every retailer who sells or will sell cigarettes and/or tobacco products in California is required to obtain a Cigarette and Tobacco Products Retailer License from the California Department of Tax and Fee Administration (CDTFA) for each retail location and renew it annually. These licensing requirements are in addition to other permits and licenses that may be required for your business operations. A Cigarette and Tobacco Products Retailer License is required before you begin purchasing and making sales of cigarettes and tobacco products in California. Prospective licensees should consult with their local health department before applying for a California Cigarette and Tobacco Products Retailer License to determine if there is a local licensing requirement in their community and learn how to comply with its requirements. In some cases, local licensing requirements may be more restrictive than state licensing requirements. Examples include, but are not limited to, electronic cigarettes, atomizers, vaping tanks or mods, and e-liquid or e-juice. A tobacco product does not include a product that the U.S. Food and Drug Administration has approved as cessation products or for other therapeutic purposes (for example, nicotine patches). Retailers of any of the products that fall under the definition of "tobacco products" or the expanded definition of a tobacco product must obtain a Cigarette and Tobacco Products Retailer License from the CDTFA prior to purchasing or making retail sales of these products. If you already have a valid Cigarette and Tobacco Products Retailer License issued by the CDTFA, you may sell the products listed above under your existing Cigarette and Tobacco Products Retailer License. A retail license is valid for a 12-month period, is not assignable or transferable, and must be renewed annually. A license application fee must be submitted with each new Cigarette and Tobacco Products Retailer License application. A separate license application fee is required for each retail location. Beginning January 1, 2017, cigarette and tobacco products retailers are required to pay an annual license renewal fee. The license application and renewal fee payment may not be prorated. A retailer that adds an additional retail location will renew the retailer license for that retail location based on a 12-month period beginning in the month the retailer license for the first retail location was obtained. For example, in February 2017, a retailer opened their first retail location, paid the license application fee, and obtained a retailer license for that location for a 12-month period. In May 2017, the retailer opened a second retail location, paid the license application fee, and obtained a retailer license for that location for a 12-month period. The annual renewal fee for both locations will be due the following February, (the month the retailer obtained the first retailer license for their first location) 2018 and every February thereafter. For license and renewal fees rate information, please visit our tax and fee rate page. A cigarette wholesaler is a person, other than a licensed distributor, who purchases and sells stamped (tax-paid) cigarettes for resale. Cigarette wholesalers cannot possess unstamped (untaxed) cigarettes. Who is required to obtain and maintain a Wholesaler License? In accordance with the California Cigarette and Tobacco Products Licensing Act of 2003, every wholesaler of cigarettes (defined in section 30016 of the Revenue and Taxation Code) is required to obtain and maintain a Cigarette and Tobacco Products Wholesaler License issued by the California Department of Tax and Fee Administration (CDTFA) for each location. A Cigarette and Tobacco Products Wholesaler License is valid for a calendar year upon payment of the fee and must be renewed annually. The license fee may not be prorated. These licensing requirements are in addition to other CDTFA permits and licenses that may be required for your business operations. For license application and renewal fee rate information, please visit our tax and fee rate page. An importer is any purchaser who purchases for resale in the United States cigarettes manufactured outside of the United States for the purpose of making a first sale or distribution within the United States (Revenue and Taxation Code section 30019). Who is required to obtain and maintain a Cigarette Importer License? Every cigarette importer must obtain and maintain a license from the California Department of Tax and Fee Administration (CDTFA) in order to engage in the sale of cigarettes in California. Maintain a valid Cigarette Manufacturer/Importer License and account. Certify when the license is granted, and each year upon license renewal, that all packages of cigarettes the licensee manufactures or imports and distributes in this state fully comply with subdivision (b) of section 30163 of the Revenue and Taxation Code, and that the cigarettes contained in those packages are the subject of filed reports that fully comply with all requirements of the federal Cigarette Labeling and Advertising Act (15 U.S.C. Sec. 1331 et seq.) for the reporting of ingredients added to cigarettes. A manufacturer or importer that is a "tobacco product manufacturer" as defined in Health and Safety Code section 104556(i), must certify to the CDTFA that it is a "participating manufacturer" as defined in subsection II(jj) of the "Master Settlement Agreement" (MSA), or is in full compliance with section 104557(a) of the Health and Safety Code. For license fee rate information, please visit our tax and fee rate page. A manufacturer is a person who manufactures cigarettes sold in this state. There are some reporting requirements imposed on manufacturers and there are additional restrictions which carry potential tax consequences regarding product promotions and samples provided to recipients at no cost, as set forth in Cigarette and Tobacco Products Tax Regulation 4081.
Who is required to obtain and maintain a Cigarette Manufacturer License? Every cigarette manufacturer must obtain and maintain a license from the California Department of Tax and Fee Administration (CDTFA) in order to engage in the sale of cigarettes in California. What are the requirements to obtain and maintain a Cigarette Manufacturer/Importer License? Certify when the license is granted and each year upon license renewal that all packages of cigarettes the licensee manufactures or imports and distributes in this state fully comply with section 30163(b) of the Revenue and Taxation Code, and that the cigarettes contained in those packages are the subject of filed reports that fully comply with all requirements of the federal Cigarette Labeling and Advertising Act (15 U.S.C. Sec. 1331 et seq.) for the reporting of ingredients added to cigarettes. Who is considered a cigarette distributor? A cigarette distributor is a person who makes the first distribution of untaxed cigarettes in this state. In general, distributors purchase cigarettes before any tax is due, and then sell stamped cigarettes to wholesalers, retailers, and other distributors. Distributors pay the excise tax by purchasing cigarette tax stamps from the California Department of Tax and Fee Administration (CDTFA). A cigarette distributor is required to affix the California cigarette tax stamp to each package of cigarettes prior to distribution to indicate the excise tax has been paid. What permits and licenses are required? In accordance with the California Cigarette and Tobacco Products Licensing Act of 2003, every distributor of cigarettes is required to obtain and maintain a Cigarette and Tobacco Products Distributor License issued by the California Department of Tax and Fee Administration (CDTFA) for each location. A Cigarette and Tobacco Products Distributor License is valid for a calendar year upon payment of the fee, is not assignable or transferable, and must be renewed annually. The license fee may not be prorated. These licensing requirements are in addition to other CDTFA permits and licenses that may be required for your business operations. For license application and renewal fee rate information, please visit our tax and fee rate page. The California Department of Tax and Fee Administration (CDTFA) developed a technology based, counterfeit resistant stamp capable of being read by a scanning device, and encrypted with specific information. The stamps are produced on tamper-evident label stock and contain secure features that can only be authenticated by authorized scanning devices. This stamp technology affords retailers, wholesalers, distributors, manufacturers, and CDTFA investigators the tools necessary to immediately determine the validity of a cigarette tax stamp. To purchase cigarette tax stamps, you must have a cigarette distributor account. For information on how to become a licensed cigarette distributor, please refer to Publication 63, Cigarette Distributor Licensing and Tax Stamp Guide. For license fee rate information, please visit our tax and fee rate page. Every wholesaler (defined in section 30016 of the Revenue and Taxation Code) is required to obtain and maintain a Cigarette and Tobacco Products Wholesaler License issued by the California Department of Tax and Fee Administration (CDTFA) for each location in order to engage in the sale of cigarettes and tobacco products in California. A wholesaler license is valid for a calendar year upon payment of the fee, is not assignable or transferable, and must be renewed annually. The license fee may not be prorated. These licensing requirements are in addition to other CDTFA permits and licenses that may be required for your business operations. A manufacturer is a person who manufactures tobacco products sold in this state. There are some reporting requirements imposed on manufacturers and there are additional restrictions which carry potential tax consequences regarding product promotions and samples provided to recipients at no cost, as set forth in Regulation 4081. An importer is any purchaser who purchases for resale in the United States tobacco products manufactured outside the United States for the purpose of making a first sale or distribution within the United States (Revenue and Taxation Code section 30019). Who is required to obtain and maintain a Tobacco Products Manufacturer/Importer License? The law requires all manufacturers or importers of tobacco products to obtain and maintain a Tobacco Products Manufacturer/Importer License before engaging in the sale of tobacco products. Tobacco products include but are not limited to, all forms of cigars, little cigars, chewing tobacco, shisha, and snuff, as well as other products containing, made or derived from tobacco or nicotine that are intended for human consumption, electronic cigarettes/vaping devices when sold in combination with nicotine, or any component , part, or accessory of an electronic cigarette that is used during the operation of the device when sold in combination with nicotine. What are the requirements to obtain and maintain a Tobacco Products Manufacturer/Importer License? Maintain a valid Tobacco Products Manufacturer/Importer License and account. Submit to the California Department of Tax and Fee Administration (CDTFA) a list of all brand families that you manufacture or import. A tobacco manufacturer or importer must waive any sovereign immunity defense or post a surety bond as provided in section 22979(a)(4) of the Business and Professions Code. A tobacco products distributor is a person who makes the first distribution of tobacco products in this state. Distribution includes the sale, use or consumption of untaxed tobacco products, or the placing of untaxed tobacco products into a vending machine or retail stock. In general, distributors purchase tobacco products before any California excise tax is due and then pay the tax when they sell or distribute the tobacco products. A tobacco products distributor is required to calculate the tobacco products tax due based on the wholesale cost of the tobacco products distributed and remit the amounts owed each month on tax return forms provided by the California Department of Tax and Fee Administration (CDTFA). Anyone who distributes tobacco products in California must obtain and maintain a Cigarette and Tobacco Products Distributor License issued by the CDTFA for each location. A distributor license is valid for a calendar year upon payment of the fee, is not assignable or transferable, and must be renewed annually. The license fee may not be prorated. These licensing requirements are in addition to other CDTFA permits and licenses that may be required for your business operations. For license fee rate information, please visit our tax and fee rate page. Fuel vendors who sell and deliver alternative fuel (e.g. blended alcohol fuels containing 15% or less gasoline by volume (E85), compressed natural gas (CNG), liquid natural gas (LNG), or liquefied petroleum gas (LPG)) into the fuel tanks of motor vehicles must collect and report use fuel tax for such sales (note exemption below). Vendors must also provide purchasers (users) with a receipt for each sale. The receipt must show the name and address of the seller, date and number of gallons or units sold (the sales invoice when paid constitutes a receipt). Exemption: Vendors are not required to collect use fuel tax for sales of LPG, LNG, or CNG if the user's vehicle has a current California Department of Tax and Fee Administration (CDTFA) annual flat rate identification decal affixed. The decal specifies the type of fuel that is exempt from tax (only the fuel specified on the decal is exempt for that vehicle). Fuel vendors who sell and deliver alternative fuel (LPG, LNG or CNG) into the fuel tanks of motor vehicles must collect and report use fuel tax for such sales (note exemption below). Vendors must also provide purchasers (users) with a receipt for each sale. The receipt must show the name and address of the vendor, date of sale, number of gallons or units of fuel sold, the price per gallon or unit of fuel sold, the amount of use fuel tax collect, unless sold at retail for a tax included price (the sales invoice when paid constitutes a receipt). An aircraft jet fuel dealer includes any person who sells to an aircraft jet fuel user, aircraft jet fuel delivered in this state into the fuel tanks of aircraft or into a storage facility from which the fuel is withdrawn for use in an aircraft. Diesel fuel is any liquid commonly or commercially known or sold as a fuel that is suitable for a diesel powered highway vehicle. A liquid meets this requirement if, without further processing or blending, the liquid has practical and commercial fitness for use in the engine of a diesel powered highway vehicle. This includes biodiesel. Biodiesel is a fuel made fully or partially from vegetable oil or animal fats. Typically it is produced by combining vegetable oil or animal fat with an alcohol, such as methanol or ethanol in the presence of a chemical catalyst. Motor vehicle fuel includes gasoline, aviation gasoline, gasohol, finished gasoline, gasoline blendstocks, and blended motor vehicle fuel. Note: Aviation gasoline is all special grades of gasoline that are suitable for use in aviation reciprocating engines. Aviation gasoline includes all grades of gasoline suitable for use in aviation reciprocating engines. If you are a marine terminal operator in the waters of the state or a refinery operator in this state, you will be issued both an oil spill response fee account and an oil spill prevention and administration fee account when you check box 11 above. Effective January 1, 2016, pipeline operators no longer are required to be registered under the oil spill prevention and administration fee. If you are a marine terminal operator in the waters of the state or a refinery operator in this state, you will be issued both an oil spill response fee account and an oil spill prevention and administration fee account when you check box 11 above. Effective January 1, 2016, pipeline operators no longer are required to be registered under the oil spill prevention and administration fee. Pipeline operators that transport crude oil out of the state or petroleum products into the state must be registered for the oil spill response fee program. If you sell lumber products or engineered wood products for use in this state, you are required to collect a 1% lumber products assessment from your customers based on the selling price of these products. Effective January 1, 2015, retailers who sell less than $25,000 of qualifying lumber products in a calendar year are not required to collect the lumber products assessment in the subsequent calendar year. 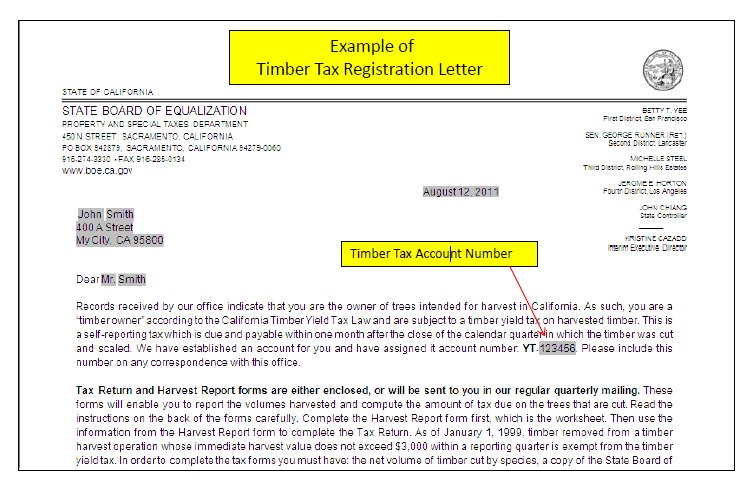 However, you must notify your customers that they are responsible for reporting and paying the 1% lumber products assessment on their purchases directly to the California Department of Tax and Fee Administration (CDTFA). As a convenience to your customers, you may voluntarily continue to charge and collect the 1% lumber products assessment from your customers and report and pay it to the CDTFA. You should maintain records of your annual lumber sales as each year you will be responsible for determining if you are required to collect the lumber products assessment based on your sales of qualifying lumber products in the prior calendar year. Keeping a record of your annual sales of lumber is especially important if your annual sales are consistently close to the $25,000 threshold. In general, lumber products and engineered wood products subject to the assessment are building products usually used in construction in which wood is at least 10% of total content. For example, all dimensions and grades of lumber, roofing, (shakes and wooden shingles), siding, lath, plywood, particle board, fiberboard, oriented strand board, I-joists, laminated veneer lumber, veneer-based sheeting material, and inorganic-bonded and wood thermoplastic composites, including plastic lumber and decking (these are examples only; additional products not listed may be subject to the 1% assessment). If you sell $25,000 or more in lumber products or engineered wood products in a calendar year, check the Selling lumber products or engineered wood products box. Do not check the box if you only sell items made from lumber or engineered wood products, such as furniture, doors, shutters, and finished hardwood or laminate flooring. Effective April 1, 2017, two new fees are imposed on purchasers (consumers), manufacturers, and importers of lead-acid batteries in California, the type commonly found in vehicles. The Lead-Acid Battery Recycling Act of 2016 imposes a $1.00 California battery fee on the purchase of a replacement lead-acid battery which dealers/retailers are required to collect from purchasers. A $1.00 manufacturer battery fee is imposed on a manufacturer or importer on sales of lead-acid batteries to a dealer, wholesaler, distributor, or other person in California. A manufacturer may also be responsible for the California battery fee for any sale of a battery sold directly to a purchaser (consumer). For additional information see the Lead-Acid Battery Fees Guide. A manufacturer is any person who manufactures and sells or distributes lead-acid batteries in California, or any person who imports lead-acid batteries into California for sale or distribution. If batteries are sold directly to consumers, the manufacturers and/or importers may be considered a dealer/retailer of lead-acid batteries. The fee applies to a lead-acid battery, the type commonly found in vehicles, which weighs 5 kg. (approx. 11 lbs.) and has a capacity of 6 or more volts. See Health and Safety Code (HSC) 25215.1 for the lead-acid battery definition or visit the Dealers/Retailers tab on the Lead Acid Battery Fees Guide. Every person selling replacement lead-acid batteries directly to consumers at retail in California is considered a dealer/retailer. A dealer includes a manufacturer of new lead-acid batteries who sells directly (in person or online) to consumers in California. The fee applies to a replacement lead acid battery, the type commonly found in vehicles, which weighs 5 kg. (approx. 11 lbs.) and has a capacity of 6 or more volts. See Health and Safety Code (HSC) 25215.1 for the replacement lead-acid battery definition or visit the Dealers/Retailers tab on the Lead-Acid Battery Fees Guide. If you purchase an item (for use, give away, store, or otherwise consume in California) from an out-of-state retailer who did not collect the California tax, you may owe California use tax. If you purchase lumber or engineered wood products from suppliers located outside of California which do not collect the 1% lumber products assessment and you will use the products in this state, you are required to pay the 1% assessment directly to the California Department of Tax and Fee Administration (CDTFA), as well as the applicable use tax. To pay the 1% assessment to the CDTFA, check the Purchasing lumber products or engineered wood products box. Do not check the box if all your purchases of lumber or engineered wood products will be made into other items that you will resell in your business. A cultivator is any person required to be licensed to cultivate cannabis pursuant to Division 10 (commencing with section 26000) of the Business and Professions Code. "Cultivation" is any activity involving the planting, growing, harvesting, drying, curing, grading, or trimming of cannabis. "Nursery" indicates a licensee that produces only clones, immature plants, seeds, and other agricultural products used specifically for the propagation and cultivation of cannabis. "Processor" indicates a cultivation site that conducts only trimming, drying, curing, grading or packaging of cannabis and non-manufactured cannabis products. A manufacturer is any person required to be licensed as a manufacturer pursuant to Division 10 (commencing with section 26000) of the Business and Professions Code. "Manufacture" means to compound, blend, extract, infuse, or otherwise make or prepare a cannabis product. A cannabis retailer is any person required to be licensed as a retailer, microbusiness, or nonprofit pursuant to Division 10 (commencing with section 26000) of the Business and Professions Code. A distributor is a person required to be licensed as a distributor pursuant to Division 10 (commencing with section 26000) of the Business and Professions Code. Microbusiness is any person authorized to act as a cultivator, distributor, manufacturer, and retailer as set forth in paragraph (3) of subdivision (a) of section 26070 of the Business and Professions Code. Accredited by an accrediting body that is independent from all other persons involved in commercial cannabis activity in the state. Licensed by the Bureau of Cannabis Control. Effective January 1, 2018, two new taxes are imposed. A cultivation tax on all harvested cannabis that enters the commercial market, and an excise tax on purchasers of cannabis and cannibis products at retail. Every distributor of cannabis and cannabis products must obtain and maintain a cannabis tax permit from the California Department of Tax and Fee Administration (CDTFA). The cannabis tax permit is in addition to your seller's permit. A per dry-weight ounce tax of $9.25 for flowers and $2.75 for leaves on all harvested cannabis that enters the commercial market and is required to be paid by cultivators to a distributor unless the cannabis is first transferred or sold to a manufacturer. The manufacturer is required to collect the cultivation tax from the cultivator at the time the cannabis is sold or transferred to the manufacturer. The manufacturer must then remit the cultivation tax collected to the distributor when the manufacturer transfers the cannabis products to the distributor for quality assurance and inspection, and testing, as described in section 26110 of the Business and Professions Code. An excise tax is imposed on purchasers of cannabis and cannabis products at the rate of 15% of the "average market price" of any retail sale by a cannabis retailer. A retailer is required to collect the excise tax from the purchaser and remit the cannabis excise tax to the distributor. A sale entered into, in good faith, and for valuable consideration that reflects the fair market value in the open market between two informed and willing parties, neither under any compulsion to participate in the transaction. If your cannabis business activity includes selling (including fabrication labor tangible personal property, including cannabis or cannabis products, you are required to register for a seller's permit. For additional information, see the industry guide for Cannabis Businesses. A lender may be a person who purchased or holds an accounts receivable acquired without recourse from a retailer. The retailer must have previously reported California sales or use tax on the sale of tangible personal property for which credit was extended to the buyer. A lender does not need to be a person already registered with the California Department of Tax and Fee Administration (CDTFA). An interstate user or common carrier includes any person who uses diesel fuel in the operation of a qualified motor vehicle in this state and/or who operates the qualified motor vehicle within and without this state or the United States. Any common carrier transporting alcohol into the state of California for delivery from outside the state is required to have a common carrier license. Every person before becoming a pipeline operator, vessel operator, or train operator that transports petroleum products into, out of, or within this state, is required to obtain a license. See Motor Vehicle Fuel Tax Law – Section 7470 or Diesel Fuel Tax Law – Section 60135. Note: If you are a train operator that transports petroleum products within California, you will be required to register as a railroad that transports hazardous material commodities by rail car (see below). Every person who operates a railroad that transports hazardous materials by rail car in California is required to register with the California Department of Tax and Fee Administration (CDTFA). See Government Code – Section 8574.34. An exempt bus operator includes any person that owns, operates, or controls an exempt bus operation. See Diesel Fuel Tax Law - Section 60039 for additional information. A train operator includes any person that owns, operates, or controls a diesel-powered train and is licensed as a railroad by a state or federal agency. See Diesel Fuel Tax Law – Section 60041 for additional information. A government entity must secure a diesel fuel tax license to operate a diesel-powered highway vehicle upon the state's highways, unless all diesel fuel is purchased tax-paid from a supplier or retail vendor, and the tax-paid fuel is used solely to operate a diesel-powered highway vehicle within this state. As a licensed government entity you are allowed to use dyed diesel fuel on the highway in your California registered highway vehicles. You must pay the diesel fuel tax directly to your supplier on purchases of undyed diesel and must report on your Government Entity Diesel Fuel Tax Return any tax due on the use of dyed diesel fuel used on the highway. Diesel fuel users are persons other than farmers, who purchase tax-paid diesel fuel and use it in a nontaxable manner. Since you are required to pay the tax directly to your supplier for the purchases of undyed diesel fuel, you are required to register with the California Department of Tax and Fee Administration (CDTFA) as a diesel user before filing your first claim for refund. "Auxiliary equipment" is equipment, accessories, or amenities other than equipment used to operate a motor vehicle upon a highway in California, which is operated from the same fuel tank as the motor vehicle. You are required to register as a use fuel user if you operate a commercial vehicle with an unladen weight of 7,000 pounds or more that uses LPG, LNG, CNG or alcohol fuel as a fuel. See Occupational Lead Poisoning Prevention Fee - Pub. 94 for additional information. The Generator Fee applies to every person who generates 5 or more tons of hazardous waste in California within a calendar year for a specific site. This includes recycled waste and waste sent outside California for disposal. The fee is determined by the total tonnage of waste generated. If the Facility Fee is being paid for a site, the Generator Fee does not apply. You will need an EPA number issued by the Department of Toxics Substance Control to continue with registration. You may contact them at 1-800-618-6942. See Hazardous Substances Tax Regulations - Regulation 3000 for additional information. A person supplying intrastate telephone communication services to a service user in this state pursuant to California intrastate tariffs and providing access to the "911" emergency system by utilizing the digits 9-1-1. A person supplying Voice over Internet Protocol (VoIP) service to a service user in this state and providing access to the "911" emergency system by utilizing the digits 9-1-1. On and after January 1, 1988, "service supplier" also includes a person supplying intrastate telephone communication services for whom the Public Utilities Commission, by rule or order, modifies or eliminates the requirement for that person to prepare and file California intrastate tariffs. A telephone corporation, as defined by Section 234 of the Public Utilities Code. An interconnected Voice over Internet Protocol (VoIP) service, as defined in Section 285 of the Public Utilities Code. A retailer, as defined by Section 6203, that is a member of the same commonly controlled group, as defined in Section 25105, or that is a member of the same combined reporting group, as defined in paragraph (3) of subdivision (b) of Section 25106.5 of Title 18 of the California Code of Regulations, as an entity described in subparagraph (A) or (B). Beginning January 1, 2016, a prepaid mobile telephony services surcharge (MTS) is imposed on purchasers (consumers) of prepaid MTS as a percentage of the sales price of each retail transaction involving prepaid wireless cards/service in this state. Any product or service, including a cell phone, when sold with prepaid MTS for a single non-itemized price, unless only a minimal amount of prepaid MTS is transferred. A minimal amount of prepaid MTS is $5 or less, or 10 minutes or less. See Prepaid Mobile Telephony Services Surcharge for additional information. Corporation – a body of persons granted a charter which legally recognizes them as a separate entity having its own rights. Estate – the whole of one's possessions; especially, all of the property and debts left by a deceased or bankrupt person. Federal Government – the United States Government, IRS, or United Stated Post Office. Individual – a single human being. Joint Venture – a form of a general partnership that is formed to complete one specific project. Limited Liability Company (LLC) – a body of persons granted a charter which legally recognizes them as a separate entity having its own rights. Limited Liability Partnership (LLP) – may only be formed by licensed persons for the practices of public accountancy, law, or architecture. Limited Partnerships (LP) – A partnership that has a General Partner(s) and a number of other partners whose liability is limited to what they have invested in the partnership. Married Co-ownership – two individuals who are married to each other. Organization/Association – a number of persons or groups having specific responsibilities and united for some purpose or work. Partnership/Co-Ownership – a contract entered into between two or more persons. Receivership/Fiduciary – A receivership is the office or functions of a receiver. A receiver is a person appointed by a court administrator to take into custody the property or funds of others, pending litigation. A fiduciary involves one who holds something in trust for another. Registered Domestic Partnership – Registered Domestic Partnerships are registered by the Secretary of State's office. State or Local Government – an organization that is the governing authority of a political unit. Local government governs the affairs of counties, cities, and towns, by locally elected political bodies. Trust – a legal title to property held by one party (the trustee) for all the benefits of another (the beneficiary). Unincorporated Business Organization (UBO) – a type of trust in which the business assets are owned or held in the name of trustees and are operated or managed by them for the benefit of holders of certificates of interest in the trust. Are you applying for a Temporary Seller's Permit? Temporary Seller's Permits are issued to those whose sales activity will last no longer than 90 days. Examples of sales of a temporary nature are Christmas trees or fireworks. "Other" acceptable forms of identification may include, but not limited to, Passport, Consular ID card, U.S. Military ID card, or Non-immigrant Visa (Type E-2). You may be required to provide a photocopy of this type of identification to the CDTFA for verification purposes. A foreign (out-of-state or out-of-country) business entity may be required to register with the California Secretary of State before conducting business in California. For more information, please visit the California Secretary of State website. FEIN stands for Federal Entity Identification Number. It is also known as an Employer Identification Number (EIN). It is a nine-digit number issued by the IRS to business entities for the purpose of identification. SEIN stands for State Employer Identification Number. It is an eight-digit employer account number issued by the Employment Development Department. An example of a change in business type is a change from a sole proprietorship to a corporation or from a partnership to a limited liability company. Will you be selling cigarette and tobacco products? Will you be selling tires (includes sales of new and used vehicles or farm equipment)? Lumber or engineered wood products subject to the 1% assessment include primary wood products usually used in construction; for example, all dimensions and grades of lumber, roofing (shakes and wooden shingles), siding, lath, plywood, particle board, fiberboard, oriented strand board, I-joists, laminated veneer lumber, oriented strand lumber, hardboard, structural panels, flakeboard, veneer-based sheeting material, edge-glued material, and inorganic-bonded and wood thermoplastic composites, including plastic lumber and decking (these are examples only; additional products not listed may be subject to the 1% assessment). If you expect to sell $25,000 or more in lumber products or engineered wood products in a calendar year, check the Selling lumber products or engineered wood products box. Do not check the box if you only sell items made from lumber or engineered wood products, such as furniture, doors, shutters, and finished hardwood or laminate flooring. If you fail to notify the CDTFA of these changes, you could be held liable for tax, interest, and penalties that incurred after you no longer own or operate the business. NAICS stands for North American Industry Classification System. It is the standard used by Federal statistical agencies in classifying business establishments for the purpose of collecting, analyzing, and publishing statistical data related to the U.S. business economy. NAICS was developed by the U.S., Canada and Mexico to directly compare the economic data across borders in North America. Select the business activity that represents the largest portion of your business income. Enter a keyword (singular) that describes your type of business. A list of primary business activities containing that keyword and the corresponding NAICS codes will appear. Choose the one that most closely corresponds to your primary business activity, or refine your search to obtain other choices. If you are a medical cannabis retailer, you may use NAICS code 446110, Pharmacies and Drug Stores. Once you have been issued an account number you can contact your local office and staff can then change your coding to Decline to State if necessary. A credit card processor is a third party vendor who provides services associated with the processing of credit card transactions between merchants, credit card issuers and merchant account providers. When a terminal is registered with the IRS for ExSTARS, a TCN is issued. The California Department of Tax and Fee Administration (CDTFA) uses this TCN as part of the registration process. Before you can conduct any business that involves fuel excise taxes, you must register with the IRS using Form 637 "Application for Registration (For Certain Excise Tax Activities)." Is used in a combination with a total weight of more than 26,000 pounds or 11,797 kilograms gross vehicle or registered gross vehicle weight. If you are a billing aggregator and do not have a PUC number, please enter the following PUC number: "9999". As a billing aggregator, you will be required to file, in addition to your return (BOE-501-TE), a billing aggregator schedule (BOE-507-TEA). Commercial cannabis businesses are required to hold a license with the proper licensing authority. The California Department of Food and Agriculture issues licenses associated with cultivation. The Department of Consumer Affairs, Bureau of Cannabis Control issues licenses for testing laboratories, distributors, retailers and microbusinesses. The Department of Public Health issues licenses for manufacturers. Please provide your license number issued by the licensing agency (if available) during registration. For more information, refer to harvest value schedules at Timber Yield Tax & Harvest Values Schedules. For "other" types of harvest, refer to Table 1, Miscellaneous Harvest Values, on harvest value schedules. For example, "other" may refer to cull logs, pulp chipwood & hardwood logs, and/or fuel chips. This is the number issued by the California Department of Forestry (CDF) and/or federal agencies such as the U.S. Forest Service (USFS) or Bureau of Land Management (BLM). By checking "Same as Timber Owner" you are indicating you are the owner of the timber and the land from which the timber was harvested. Timber owner and land owner are NOT ALWAYS the same entity. City limits are the boundaries around the area of a city which the city authorities have jurisdiction. An address outside the boundaries is regarded as being outside the city limits. An address within the boundaries of a city is regarded as being within the city limits. You may pay the tax while your claim is being reviewed to avoid the accrual of additional interest. If your exemption is granted, you may qualify for a refund. This amount may include tax, fee, and/or penalty and interest. eCheck (ACH Debit) – Provide the California Department of Tax and Fee (CDTFA) your banking information to debit your bank account for the amount of your payment. Enter your 9-digit routing transit number, bank account number, and select type of account (checking or savings). Your payment will be debited from your bank account the next banking day following the payment effective date. Credit Card – American Express, Discover, MasterCard and Visa are accepted. You will be directed to our third party vendor, Official Payments Corporation (OPC) to submit your payment. A service fee of 2.3% of the transaction amount will be charged by OPC. This fee is not revenue to the CDTFA. After paying by credit card, be sure to click "continue" to be routed back to the CDTFA's online registration to check your application status. Paper Check – A payment voucher showing the amount due and the due date may be printed from the Registration Status page. Mail the payment voucher with your payment to the address shown on the voucher. *Please Note: Payment vouchers are available for payment of use tax on one-time purchase item(s) or paying use tax for vehicle, vessel, aircraft, and manufactured/mobile home transactions.